Demon Lobster RP: The Return of Heroes Episode 26! Demon Lobster RP: The Return of Heroes Episode 25! Demon Lobster RP: The Return of Heroes Episode 24! Demon Lobster RP: The Return of Heroes Episode 23! Demon Lobster RP: The Return of Heroes Episode 22! 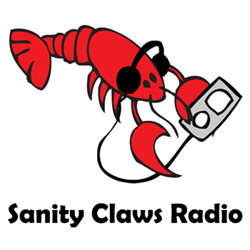 Sanity Claws Radio – March 2019 Catch Up! We play a little catch-up in this round up of February on this episode of Sanity Claws Radio. Lindsay, Mike, Karen, Scott, and Jon talk about what we’ve been up to in this extended roundtable catch up session! Karen and Scott take their time with the conclusion of Adventure Time, Mike gets critical, Lyndsay goes back to some classic Anime, and Jon gets direct with Tetris 99! Then, we finish the show with a “Would You Rather…” round of I Can Top That! Demon Lobster RP: The Return of Heroes Episode 21! Demon Lobster RP: The Return of Heroes Episode 20!